Founded in 1732 and incorporated in 1854, Salisbury has grown to be the largest city on the Eastern Shore. The tremendous growth made organized fire protection imperative. This became painfully clear on August 18, 1860 when a fire destroyed the entire town, home to 500 residents, and again in another fire in 1886 which destroyed the town for a second time. The fire also consumed the small hand pumper used to fight this devastating fire. So in 1872, with funds raised by public subscription, a small hand engine was purchased and put into service. 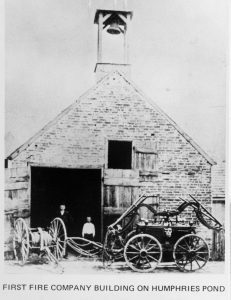 Seven years later on August 28th, 1879 the Salisbury Fire Department was officially born. 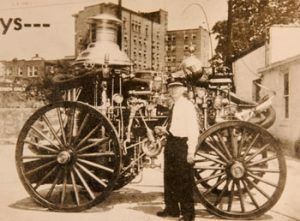 Dr. L. S. Bell was elected the Department’s first Chief, and with the acquisition of a $4,100 Silsby steam powered fire engine, the citizens of Salisbury had a Fire Department of which it could be proud. The following year, William B. Tilghman founded Tilghman Truck Company No. 1. Tilghman encountered constant shortages of equipment and manpower in the early days of the Department. Just after the turn of the century, the City passed an ordinance that called for a firefighting force of forty men. The Department was reorganized and G. Edward Serman was named Chief. As technology improved, new equipment was acquired. Salisbury saw its first motorized apparatus put into service in 1916. It was a Type 12 Triple Combination Pumper and had an output of 1000 gallons per minute. With this era of tremendous growth came the need for a larger base of operations for the expanding department. Fire Chief John D. Lank was the first chief in Salisbury’s newly built Firehouse that was formally dedicated on February 3, 1928. Firehouse Number One served as home to a volunteer company of 50 men. This Firehouse would remain in working use from 1928 until 2008. Firehouse Number Two, still in use today, was built in 1930 by a number of local affluent businessmen and as a result of several disastrous fires in the industrial mills on the City’s east side. During World War II the Salisbury Fire Department faced increasing challenges as many of its members were called away to fight in the war. 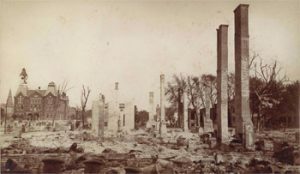 Multiple fires during that period caused losses from fire damage that rivaled the 1886 catastrophe. The City’s fire marshal was appointed to address this growing problem. Fred Grier Jr. established standards for equipment needs, training, and removal of fire hazards throughout the City. Also during this time, Civilian Defense equipment was used to equip a fire boat which was to become the Marine Division of the fire department. This specialized division responded to commercial district fires as well as all waterfront blazes. Moving into the 1950’s, losses due to fires in the C ity declined through fire prevention awareness and code enforcement by the City’s fire marshal. The Department continued to expand its’ fleet of firefighting apparatus that now included two American LaFrance 750 gallon per minute pumpers. In contrast to the previous decade, the sixties brought with it some of the largest fires in SFD history. 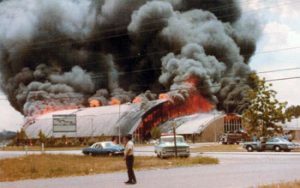 Events that stand out in this decade are the fires at the Ullman Theatre in December of 1963, Homestead Dairy and Erwin Electric Store, both of which occurred in 1964, Moore’s Lumberyard in February of 1967, and the Essco Supply fire in May of 1967. 0 gallon per minute pumps and a new 100 foot aerial ladder were purchased in the early seventies. The Hurst tool or “Jaws of Life” was also placed in service on the City’s only rescue truck and self-contained breathing apparatus were placed in service. Two years later another major fire struck the community. 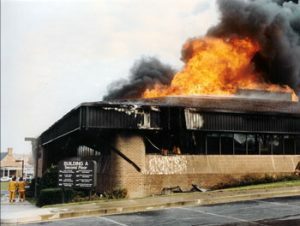 Flames roared through the Wicomico Youth & Civic Center, on June 27, 1977. Fire had engulfed the main structure before firefighters arrived on the scene. They were met with a tremendous wall of flames and thick billowing smoke. They fought hard but were unable to bring the blaze under control and the main portion of the building burned to the ground. However, firefighters were able to save the Midway Room that still stands and is in use today. Ano ther major fire occurred in July 1979 in the Downtown section of the City. The Benjamins fire brought fire departments from as far away as Ocean City and Cambridge to assist the Salisbury firefighters. The eighties began with another change in leadership. During Chief Francis Darling’s tenure, Salisbury’s Fire Department would see advancements in all phases of firefighting. Large diameter hose would be placed into service on apparatus increasing the Department’s ability to ensure adequate water supply at fires. In 1981, a full time training officer was appointed to assure that all members received sufficient training. On April 12, 1986, Salisbury added a new facility as Fire Station #1 opened on Beaglin Park Drive. In October 1988 new fire engines with completely enclosed crew cabs for firefighter safety were placed in service. This would bring an end to the decades old practice of riding on the tailboard of fire trucks. Fire activity continued to increase at a steady pace. In 1983 alone the Department responded to over 1000 fire alarms. One of the largest fires of the decade would require assistance from departments from all over the Eastern Shore. A fire at the Eastern Shore Warehouse complex in Fruitland started on a warm and windy afternoon and quickly spread to the entire block. The fire response would include every piece of Salisbury’s apparatus and every available firefighter. ors of one of the twin medical buildings. Crews were able to save thousands of medical records from the building, but losses still totaled over a million dollars. In 1992, William Higgins was appointed Fire Chief. He initiated a home fire safety inspections program to help stop the rise in fire deaths. During the same year Station 2 gained much needed space with a newly completed addition to the facility. In 1993 a dedicated team of firefighters was established as the Department’s Fire Prevention task force. These men visited all the schools and day care facilities in the district to teach fire safety. Fire Station #2 received its first aerial apparatus in 2000 and a heavy duty rescue vehicle in 2001. The rescue vehicle was later reassigned and now serves as Rescue 16. The year 2001 would bring another first to the SFD. Stephen Brezler, a retired Battalion Chief from Baltimore County (MD) became the first Chief appointed from outside the ranks of the SFD. The City commissioned an evaluation of its fire service conducted by an independent consultant. The consultant in conjunction with the participation of many Department members created a strategic plan to improve the Department’s service delivery. Chief Brezler began to implement many of the recommendations of the strategic plan. Chief Brezler was instrumental in the establishment of the Department’s Special Operations service, formed in 2001, and designed to provide response and mitigation of hazardous materials emergencies, confined space entry and rescue and trench rescue operations. When Chief Brezler resigned in 2003, Deputy Chief David See was appointed as Chief of the Department. Chief See’s main platform was firefighter safety and he was also committed to continuing the implementation of the Department’s strategic plan. Outdated equipment and facilities were identified as contributing factors that adversely impacted firefighter safety. As a result of months of investigation and evaluation every member’s personal protective equipment, or turnout gear, was completely replaced in 2005. In 2005 Fire Station #1 under-went a major renovation and transformation into a model modern public safety facility. An additional apparatus bay, a new kitchen and meeting room were added to the existing building. Existing facility space was redesigned to create a dormitory, office space and improved utility facilities. Three new state of the art EMS units were purchased in 2005 and in 2006 the Department replaced its aging self-contained breathing apparatus with all new units. The fire engines purchased in 1988 were replaced with new units with foam firefighting capabilities in 2006. Chief See retired in 2009. Today, the Salisbury Fire Department, under the command of Chief Richard A. Hoppes, operates out of three stations with 75 career personnel and 120 volunteers. The department covers and area of 48 square miles that includes the City of Salisbury and surrounding areas providing fire, EMS, technical rescue and special operation services on a 24/7 day basis. In 2017 the department responded to 3516 fire incidents and 9924 EMS incidents.